B&O’s first video machine was indeed a high-tech wonder. It was based on the Philips VR2020, the machine that launched the V2000 system. Full microprocessor control of the mechanism, timer and tuner put this model “simply years ahead” of anything else availiable at the time, and the performance of the dynamic track following system provided a picture worthy of showing on a Beovision. Text copyright © Beocentral. Unauthorised reproduction prohibited. 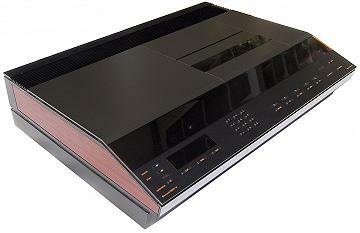 Philips provided re-badged versions of the VR2020 to other manufacturers, such as ITT, but only B&O where allowed to release a visually distinctive model, which featured black anodised aluminium panels and teak or rosewood trim. Beocord 8800 V also included a different sound circuit with improved bass response. Remote control was with the video terminal provided with the then current Beovision range, such as Beovision 8800. Text copyright © Beocentral. Unauthorised reproduction prohibited.